QR-Codes are so popular these days and that is why this black pillow is hip. This pillow shows a QR-Code and I don’t know what the QR-Codes hides so maybe get your own pillow and tell us what it means. The pillow is 18 x 18 inches and the image is 11 x11 inches. You can zip the cover open so that you can wash it. And of course the inside “pillow” is there to so no worries you can start throwing it at your friends the moment you get it. 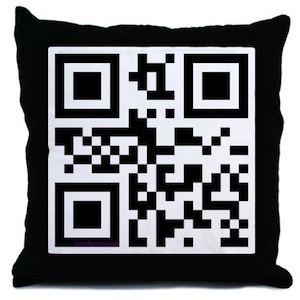 Go wait no longer and just order a QR-Code Pillow.